Spring is here and it has sure felt like it on Ararat. It has been wonderful to have the sunshine after so much rain and the fields are loving it! We just had another new calf! We missed the birth just by a few minutes. It was so neat to be able to watch the calf stand and nurse for the first time. All wobbly and so adorable! There has not been a tremendous amount of events on the farm this month. For one reason it has rained so much on and off that it has been difficult to get started on the normal spring routine. The creek came up so high from some of the rain storms that it flushed a lot debris into the field which we picked up. The cattle are still doing well on the ridge because the creek has been up too high for them to cross. As soon as the creek goes down we plan to move the cows to the upper lot (close to the barn) so we can put ear tags on the new calves to keep track of them and their mothers. As well as castrate the last year bull calves. In prep for the the cows to be in the fields we took several sunny days and put in a new feeder fence in the granddaddy bottom (the main fields) as well as fixing fence in the upper lot. The fields are becoming so green and lush just waiting for the cows to be on them. We don’t have piggies yet because we are letting the field rest and recover from the last batch. The last piggies tilled up the field quite a bit so it needs a rest. We spread clover over it to help it recover. The cows enjoying an apple treat! Well, That is the update from your farm. 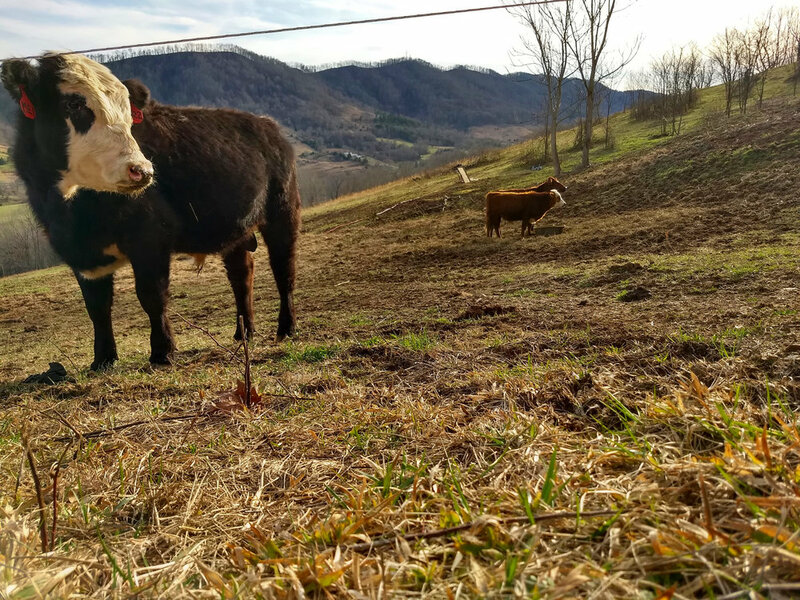 We are going to be getting Spring Beef started too! We will keep you up to date with everything. I hope you all enjoyed this update and have a wonderful week.